New reports out of war-torn Aleppo indicate a fragile ceasefire that took effect yesterday collapsed this morning, prompting busses meant to evacuate civilians and rebels to return empty to their depots. The ceasefire, which was agreed to by Turkey, Russia and the Syrian rebels, was reached Tuesday. 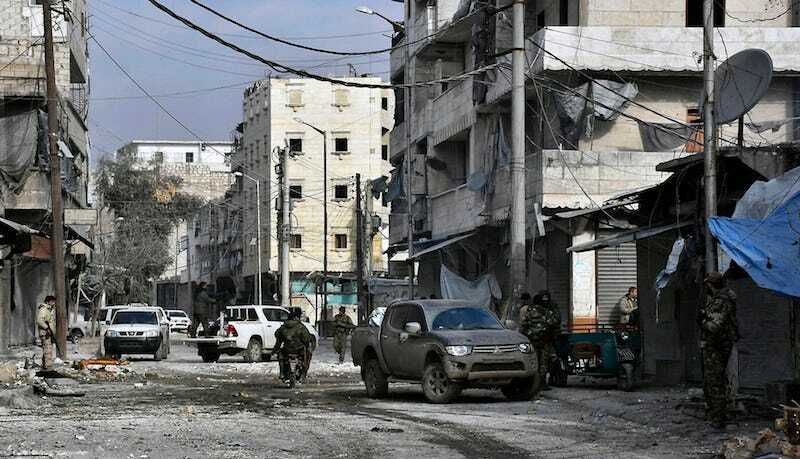 Under its terms, the New York Times reports, control of the city would be turned over to Syrian president Bashar al-Assad and thousands of civilians and rebels would be safely evacuated by bus or moved to government-controlled areas. But by Wednesday morning, it was clear plans had changed. One television television network, Al Mayadeen, reportedly showed busses intended to evacuate 5,000 fighters and their families idling empty. They eventually drove off without any passengers, a Lebanese network reported. It’s a dire situation in Aleppo, where tens of thousands of rebels are surrounded by government forces and reportedly lack even a semblance of rescue or medical operations. They met the news of the evacuation with “relief, exhaustion, and grief,” the Washington Post reports. The Russian Defense Ministry confirmed the collapse of the deal Wednesday, telling the Times the rebels had “resumed the hostilities” at dawn by trying to break through Syrian forces in the northwest. In eastern Aleppo, residents expressed alarmed as Russian news agencies broadcast remarks from the Russian foreign minister, Sergey V. Lavrov, who said he expected the rebels to “stop their resistance within two, three days.” Those remarks alarmed observers, as the evacuation deal says rebels had already agreed to stop fighting in exchange for being allowed to leave. “They are planning to slaughter us all,” civilian activist and journalist Monther Etaky told the Times. There are still other indications the plan was sandbagged by Iran—rebels tell the AP the Iranian field commander stationed in Syria felt annoyed he hadn’t been consulted by Russia and Turkey before striking the deal with the rebels and tried, unsuccessfully, to introduce last-minute changes to the deal. Syria, on the other hand, reportedly told the AFP Damascus objected to the number of people leaving and wanted their names. In an impassioned speech Tuesday, US Ambassador to the United Nations Samantha Power railed against Assad, Russia and Iran for continuing to massacre innocent people. “Are you truly incapable of shame? Is there literally nothing that can shame you? Is there no act of barbarism against civilians, no execution of a child that gets under your skin?” she said.